There is a saying that goes, “If you try to appeal to everyone, you will ultimately appeal to no one.” I’ll just give you a minute so you can go back and re-read that quote again… seriously, read it again! So now let me ask you… WHO are you trying to appeal to? If you’re spent hours and hours creating a signature program or workshop or even social media post that you’re certain is going to be flooded with positive response and people banging down your door to get in in it, only to be met with **crickets** (and don’t worry we’ve all been there), then chances are you need to go back and do some work around identifying your Ideal Client Avatar. 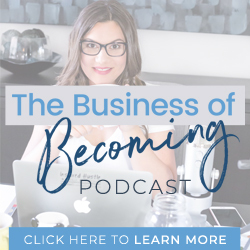 This is one of the first steps I take my students through in The Wellness Business Academy, because here’s the truth – If you don’t know who you are trying to attract and who you are talking to when you put content out into the world, then what are doing? Likely, you’re haphazardly throwing spaghetti at the wall to see what sticks. But that doesn’t feel good and it certainly won’t help you grow your business. So let’s agree to stop it with the spaghetti and take a deep dive into all the details about getting to know your ICA – your Ideal Client Avatar. Let’s start with what a ‘niche market’ is… think of it like a category, e.g. menopause / weight loss / post-natal / gut health / autoimmune disease, children’s health, etc. That means that an ‘ideal client’ is a multi-faceted profile of a specific type of person under that niche umbrella. Then, there are likely hundreds (of thousands!) of that specific type of person who all experience similar pains, symptoms and struggles. The archetype of that ONE ideal person represents your ICA. Who are your people – and how are you attracting them? Pain points, symptoms, root causes of their struggles. Basically, what are they typing into Google when they are trying to figure out what’s going on with them? Personality, core values, demographics, likes/dislikes, habits, attributes, life experiences… essentially it’s the “story” that is going on inside their head. *ACTION: Take some time to sit down and really think about those two points above. Put your phone away, pull out a journal or notebook and write down every word that comes to mind. Then, use YOUR stories to draw your people in, using the words they use. The fact is, it doesn’t matter how much pain your ICA is in, they need to resonate with you as a person first. So, use ‘moment in time’ stories and teaching content to magnetize your ICA. What experiences have you gone through that will have your people feeling like, “OMG she’s telling MY story!”. Do you communicate in a way that is going to attract your ICA? I don’t use script fonts, I don’t use pastels, I don’t use fluffy language and I sure as sh*t don’t sugar coat things. You’re always going to get nothing but straight-talk from me. I do talk a lot about being a mom, a lot about ambition, a lot about my own experiences – both the Light and the Dark. And why? Because I want to attract similar people in personality to me, and I want to repel everyone else. Yes, completely repel them. If you’re trying to talk to everyone, then you’ll end up talking to no one. So, I use my own ‘moment in time’ stories to attract health & wellness professionals who resonate with my life and business experiences. My stories, my personality and my content pulls them into my world and helps to build rapport in such a manner that they say to themselves, “see, she gets it, I can trust her”. This is the power of attraction in action! Then, once they are in my world that’s where I can connect their symptoms and root causes to their lack of success. It’s just a matter of connecting the dots for them. I show them the gap, provide them the tools to build the bridge, and then invite them across into transformation. Let’s look at another example: the amazing Laura Wood of Lavish Nutrition, and the Nutritionist behind the High Fat Low Carb (HFLC) DFY Program. Her brand is the complete opposite of mine. Laura’s is pretty, pink, frilly fonts, and feminine. That’s how she is in life. She wears makeup, loves clothes and is totally girly. And she’s still fierce AF. And guess what? She naturally attracts those kinds of women: girly and fierce AF. She uses her brand, her stories, and her content to attract the kind of women who first resonate with her as a person, and who are also wanting to lose weight without giving up wine and chocolate. Once they are in her world, she educates them and connects their symptoms to the root cause. In other words, she shows them the reason why nothing else has worked before and how she has THE solution to their problem. But… she needs to get them into her world first. Your brand is created in a way that attracts your ICA to you — the colours, the fonts, the language, the stories, your voice, core message, and your own personality. It’s the whole branding package. This is all to say that –YOUR STORY MATTERS. Who you are as a person matters. People will flock to you just because of who you are. The more imperfect the better too, because it makes you more authentic and relatable. Think about sharing a story – your amazing story, with your audience that will have them nodding their head in agreement saying, “oh ya, she gets it”. Don’t overthink it either. Just share a time in your life that you think your ICA has gone through or is currently going through. *ACTION: Grab that paper and pen again and list out all the stories and anecdotes that come to mind that you can share with your ICA. Use these ideas for social media posts, Facebook Lives, blog posts and emails to your people. Once you’ve determined your niche market, and you’re starting to have an idea of WHO your people are, and HOW to attract them (valuable content + stories that resonate), let’s strategize how to get to know them on a more intimate level, and go deeper into the nurturing process. Understanding more precisely the type of client you want to work with can have an enormous impact on how productive you are, how effective your marketing and outreach efforts are, and how fulfilled and successful you feel in your business. Before you look externally to find the right people to work with, you need to do a complete internal assessment or audit. It may even seem counterintuitive to have to know yourself before you can get to know your ICA, but consider that they are THE specific type of person you will find most rewarding to work with on most levels. If you’re feeling worn out, drained, or just plain frazzled in your work, it may be because you are not attracting your true ICA to your biz. So, be true to yourself as you evaluate what characteristics make up your “dream client” profile – because they are simply a reflection of YOU. Online as well as offline networking can help you get more in tune to your Ideal Client’s needs. But, don’t just engage in social media groups (hello Facebook group addicts, I’m looking at you!) or go to local networking events just for the sake of saying you’re “networking”. Choose groups, events, and online communities that are also attractors of your ICA. Make a point of interacting with them where they are on a regular basis and pay close attention to their most pressing concerns. Get in front of them. A great way to get in front of your Ideal Clients and really learn about their needs is through public speaking. You can gain valuable feedback about your talk at the end and in doing so, get to know your ICA better. The key is to focus on groups and organizations that already serve your Ideal Client. Talk to the person in charge of education and give a talk on a compelling topic that addresses the needs they’ve identified. Your business may be entirely online so doing local talks or physically meeting with people may not be the best tactic. However, with all of the great survey and polling options available (like Survey Monkey, Interact, Typeform, Google forms) – you can gain really valuable insights this way too. Immerse yourself in your Ideal Client’s world by hanging out with them, chatting with them, starting conversations, and asking them specific questions that lead to discovering what they need, and the problems they face. When you’re using your own Facebook page or if you have your own FB Group, you can create a poll or you can send out a survey via email. You can even offer a little incentive/giveaway to maximize the volume of answers. No more guesswork about what your Ideal Client needs – just ask them! What gender, age, income bracket are they? Where do they hang out? Online, offline? What do they talk about? What questions do they ask? Where do they get their information and answers from? What are their pain points, challenges and struggles? What are their goals and priorities? What brands do they like? What do they gravitate toward? What words, phrases and language do they use? What does a day-in-the-life look like for your ICA? Give your your new dream client a name! This is an exercise that we get students in the Wellness Business Academy to do in great detail as it’s an essential part of building the very foundation of your health business. Here’s an example of how you might go deeper into your niche in order to make inroads into an even more refined audience. Let’s say your niche is menopause and you’ve been trying to reach ALL menopausal women – that’s a rather massive audience. Can you go deeper into that niche? For example: ‘adrenal dysfunction during menopause’, rather than ‘all things menopause’ such that you’re now trying to attract menopausal women who are specifically struggling with their adrenals. This is much more refined and would be easier to get to know this sub-audience more intimately. After all that, now you should have a really detailed profile of your ICA, so be sure to put it to work! This translates to infusing your ICA in all areas of your business, from crafting your products, programs and services to creating content, cultivating your brand, your digital marketing – and even how you write your sales copy. Use the above tips to guide you in establishing a complete framework of your Ideal Client: identifying them, attracting them, knowing them deeply and nurturing them on every level. One of the biggest mistakes I see new health business owners making is coming up with products and programs, and then trying to fit people into them. When it should be the other way around: determining the right people to work with, identifying their major pain points, and creating the solutions to their problems. Don’t be put off by this process, and don’t be afraid of the answers that start to come up either. This is where REAL CHANGE BEGINS TO HAPPEN and you’ll be struck with the realization that you have an honest to goodness business on your hands! *ACTION: Take a deep breath. And remind yourself that your ICA and your business in general will continue to evolve and refine itself as you work with more and more clients. So don’t let the above process stop you from taking imperfect action and get started. Pick something and go with it, knowing it will continually change. Don’t believe me? Check out this #FlashbackFriday post on my Instagram Account for a look back at some of my past branding! If you still have questions about your Ideal Client and how to position your offerings to appeal to that specific person then I invite you to join my Take Your Health Practice Online Facebook Group. In there you can connect with more than 8000 Alternative Health Practitioners building and growing their businesses online. I’m also in there regularly doing LIVE hot seats and giving feedback on signature programs, lead magnets and ICA stuff, so get in there now and join the party!